This week’s book is Nadia’s Little Black Dress Diet by former Celebrity MasterChef winner, Nadia Sawalha. And while I am leaving the little black dress to my wife, the book does have some really good recipes for people like me looking to lose a couple of pounds but still enjoy their food! 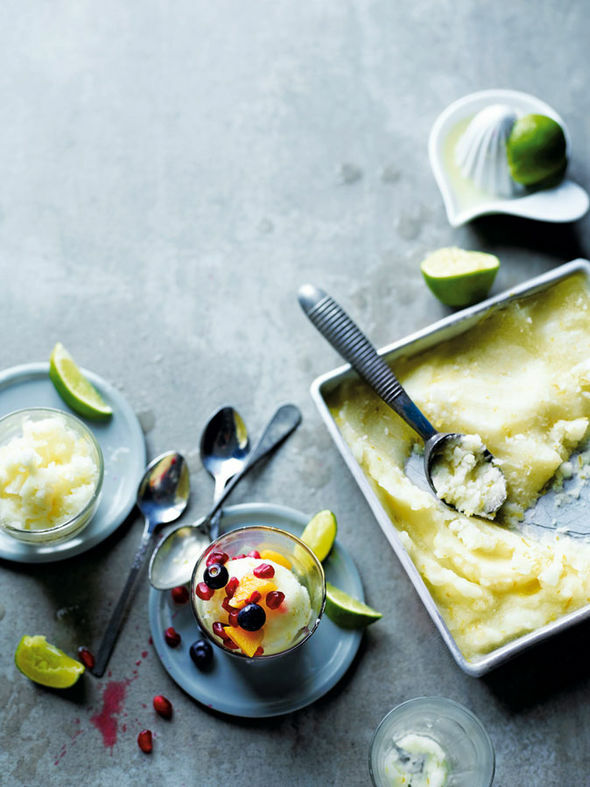 The classic Sunday lunch recipe and zingy lemon and lime sorbet (opposite) are delicious. Enjoy! Preheat the oven to 240°C/464°F/Gas Mark 9. Drizzle the oil over the chicken, season well with salt and black pepper, and rub in and sprinkle the herbs over the top. Put the bird breast-side down in a large roasting tray and scatter the onions, carrots, celery and garlic around it. Roast for 15 minutes. Pour the stock on top of the vegetables (but not over the chicken) and reduce the heat to 200°C/392°F/Gas Mark 6. After 30 minutes, turn the chicken over to allow the breast to brown. Baste with the juices from the tin and cook for a further 30 minutes. Then pierce the chicken in the thigh with a skewer and if the juices run clear, take it out of the oven (if they don’t, put it back in the oven for a further 10 minutes) and rest for 15 minutes. Serve with your favourite steamed vegetables and a sweet jacket potato, sage and onion balls or roast jacket potatoes. Pour 300ml cold water into a pan with the sugar and the zest of 1 lemon and zest of 1 lime. Put over a medium heat and keep stirring until the sugar dissolves. Then turn off the heat and leave to cool. Add the lemon and lime juice. Pour the mixture into a shallow container and put it in the freezer. Give it a stir every hour or so, otherwise crystals will form. When the sorbet is half frozen, beat the egg white into soft peaks and fold into the mixture. When the mixture looks as though it’s beginning to set, freeze until it is firm. Serve with the berries of your choice.